The Adventures of Lai Lai & Chub-Chub, Lai Lai Meets Chub-Chub, was written by Dr. Aaron Chokan, and illustrated by Amy Rottinger. It is a story about a preschool girl who is getting a puppy and needs to find the best name for her new little friend. Lai Lai spends her time outside in their lovely park-like yard, watching other animals, and trying out different names to see if she likes them. Nothing seems quite right to her. The children reading the story, or having it read to them, are encouraged to think of names and “shout them out.” In the end, Lai Lai chooses Chub-Chub, when she sees a groundhog digging, which inspires the name “chub-chub.” Chub-Chub is the perfect name for her new puppy. She is very happy with her choice. 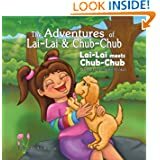 The Adventures of Lai Lai and Chub-Chub is lovingly written by Dr. Chokan, who wants to involve his preschool child, Calais, in the Lai Lai and Chub-Chub stories. Dr. Chokan uses an “audience participation” device to involve children in helping Lai Lai choose a nice puppy name. Clearly, there will be more fun and joyful adventures to come. This story is beautifully illustrated by Amy Rottinger. Her character illustrations are happy, smiling, and appealing. Her animals and the beautiful park-like setting make you want to be right there with Lai Lai. Through the artwork, the reader is pulled into the story which becomes a mini-quest. This is a warm and sweet little story that preschool through second-grade children will enjoy reading and hearing. The older children can write down their puppy names and even draw a picture of their own puppy. I’m hoping this story series means that there really is an adorable Chub-Chub puppy at Dr. Chokan’s home! Hi Margo, this is a sweet little story, with a lot of love in it. The part where the author asks kids to suggest puppy names would be fun with your daughter. Thanks for your support. Thank you for taking the time to share your thoughts on this book. Hi Virginia, You're welcome. It's a sweet book and I wish Dr. Chokan much success. My new book, "Magical Mea," is up on Amazon!